Remember when I had that goal of coming up with a recipe name that was an alliteration? I think I’m getting close with this one – shrimp, shallots, and sun-dried-tomatoes spaghetti. OK, hyphenating sun-dried tomatoes is a little bit of a cheat and I didn’t actually use spaghetti but you have to admit it’s not a bad attempt. I’m determined to make that alliteration goal yet. I have no control when it comes to pasta and would happily inhale an entire pan full of any type of pasta given half the chance. So, I try not to make too many meals where pasta is the main component. However, once in a while, I find a pasta dish that is so good that it is worth all the temptation and extra carb calories. This is one of those recipes. The creamy madeira sauce spiked with sun-dried tomatoes and shallots is totally worth the extra time on the treadmill. The original recipe called for using 4 different pans in preparing this dish which is about 3 too many for a weeknight meal in my opinion. So, I reduced the number of pans to 2 by skipping the step of making shrimp stock with the reserved shrimp shells and using bottled clam juice instead. This also reduced the overall prep time. I also used the same pan to cook the pasta and make the sauce. The second pan comes from frying the shallots which adds a nice finishing touch. You could skip the fried shallots if you were in a hurry but I do recommend making them if you can. They really are worth the extra time (and dirty pan). In a small bowl, toss the shallot rings in the flour until coated. In a 10-inch skillet, heat 3 tablespoons of the olive oil over medium-high heat until shimmering. Add about half the shallot rings to the hot oil and fry until golden brown, adding more oil if necessary, 3 to 4 minutes. Stir the shallots occasionally to promote even browning. Using tongs, transfer the fried shallots to a paper-towel-lined plate and sprinkle lightly with salt. Repeat with remaining shallots. Set aside. Bring a large pot of lightly salted water to a boil and add the penne pasta. Cook the penne until just al dente, about 10 minutes, stirring occasionally. While the pasta is cooking, prepare the sauce ingredients. Pat the shrimp dry with paper towel. Toss the shrimp with 1/2 teaspoon kosher salt and 1/2 teaspoon pepper until evenly coated. Set aside. Slice the sun-dried tomatoes into julienne strips and thinly slice the garlic. Set aside. When the pasta is done cooking, drain the pasta. Set aside. Wipe out the cooking pan and add 2 tablespoons olive oil and the butter. Heat the oil and butter over medium-high heat. When the butter is melted, add half of the shrimp and cook until just cooked through, about 30 seconds per side. Transfer to a plate and repeat with the remaining shrimp. Add the remaining 2 tablespoons of oil, garlic, and shallot strips to the pan and cook, stirring, until golden brown in spots, 2 to 3 minutes. Add the Madeira and cook until almost fully evaporated, about 3 minutes, scraping up any browned bits from the bottom of the pan with a spatula. Add the tomatoes and cook another minute. Stir in the cream and clam juice; cook until the sauce thickens, 4 to 5 minutes. Add the shrimp and cook until just heated through. Season to taste with salt and pepper. Add the pasta to the sauce and toss until the sauce evenly coats the pasta. Divide the pasta among four shallow bowls, garnish with the parsley and fried shallots, and serve immediately. If you can’t find clam juice, you can make a shrimp broth from the shrimp shells. 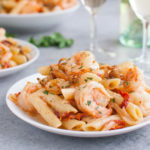 In a 2-quart saucepan, boil the shrimp shells in 2 cups of lightly-salted water until the water is reduced to about 1 to 1 1/2 cups, about 5 minutes. Strain and set aside. Recipe adapted from Fine Cooking, Apr/May 2016.